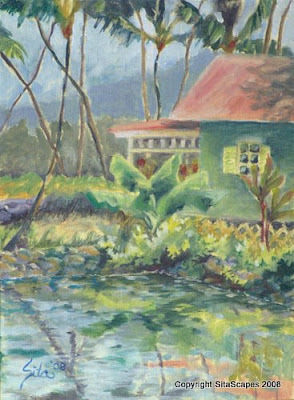 Artists Comments: The reflection of the sky, cottage and landscaping as it danced across the fresh water pond was my inspiration in attempting this painting. I soon found that reflections in the water were just as about difficult as painting shadows in the sand. I also experimented with thinning out my paint to create sheer layers of color. I would like to create a series of washes on my next painting.